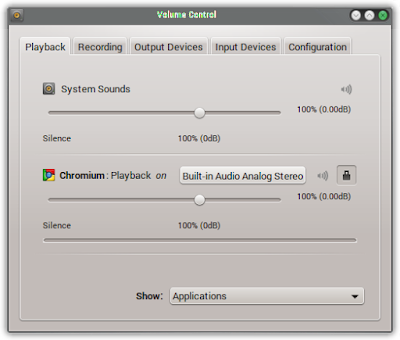 After installing Chrome 42 on Manjaro 0.8.12 (KDE) the volume somehow turned way to low in everything Chrome.Other programs like VLC were not affected. Research on the net didn't brought something up, so I played around and found a solution for this. Click on the tab "Playback". Note that only active applications are showing up. So unless Chrome is making some noise, it won't be visible. So make sure you play soemthing with sound, like a video in the browser. Then you can set the Volume back to 100%. It was about 50% on my machine. Close the window and you're ready to enjoy full volume in Chrome again. I don't know why and how this happened. I'm suspecting it had something to do either with the update of Chrome to version 42 (never happened before that version) or with Google Play Music. 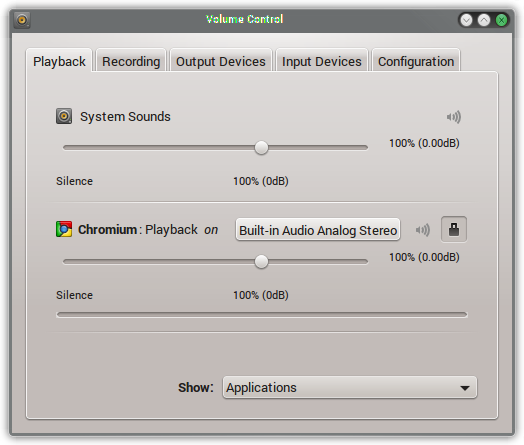 This might work on many more GNU+Linux distributions that comes with PulseAudio. Just use your package-manager. Pavucontrol is almost in any repository. Like always, do this at your own risk and have a lot of fun!